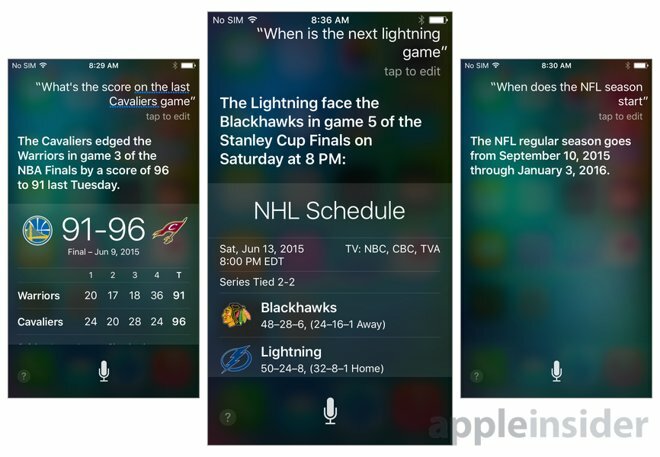 Sports and weather have previously been available via Spotlight and Siri, but iOS 9 expands their usefulness. Entering just the name of a baseball team is enough to retrieve the score of their last game, along with their upcoming schedule and related websites. Weather is now more detailed, showing hour-by-hour forecasts along with current conditions. 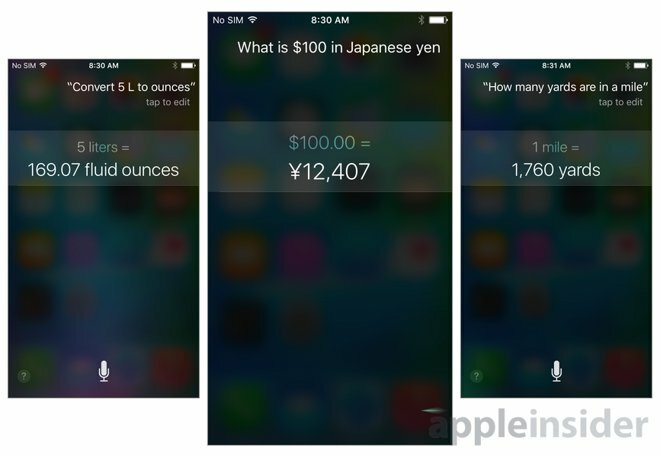 Siri now seems to have basic math skills baked in, no longer relying on Wolfram Alpha for unit conversions or simple equations. Typing in "8 cups" will instantly provide a conversion to liters, for instance. Searching for contacts brings a new quick-access layout, with buttons to initiate a FaceTime call, message session, or phone call with people in the search results. Previously, users had to tap on a search result and were brought to the Phone app to complete the action. 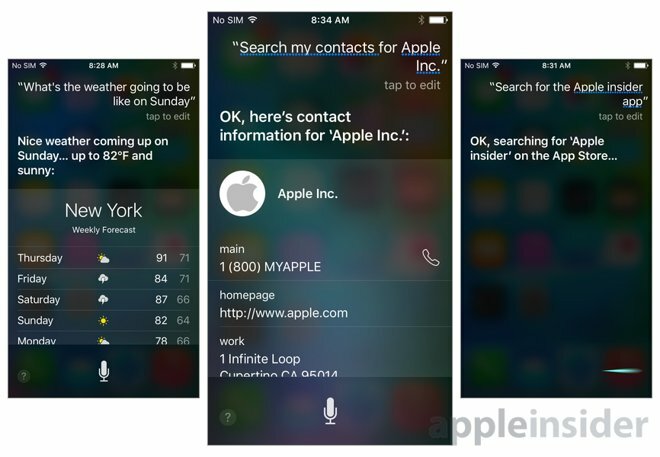 Siri also gains the ability to search within apps, and link directly to content within those apps. For example, users who recently searched for flights to Maui via the Kayak app could search for "Maui" using Siri and be taken directly to the Kayak search result. Additionaly, Siri now comes with more context about users' data. 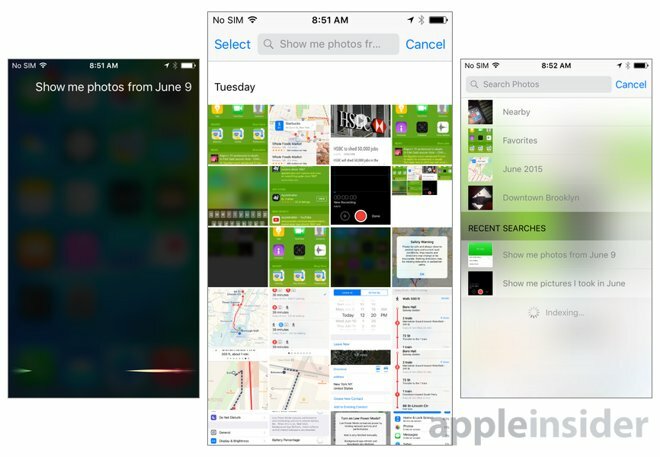 Asking Siri to "show me photos I took in May" will bring the user to the Photos app with only those photos shot in May displayed, while saying "Remind me about this tonight" will automatically create a context-aware reminder— for instance, Siri could prompt users to revisit an email later on.